Servicing all boiler brands including Worcester, Bosch, Vaillant, Baxi, Ideal, etc. Make an online booking for gas boiler replacement. 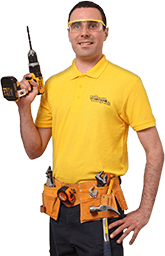 A gas safe certified technician will come to do a survey. Within 2 workdays, you will receive a detailed quote for the job that includes costs for labour, materials and a new unit. 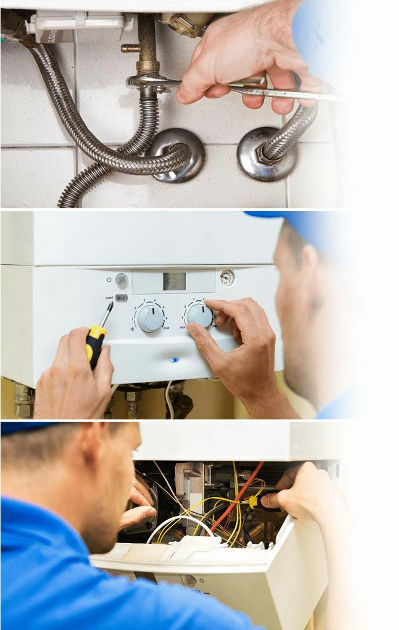 The technician will return to your property and replace your boiler. In accordance with the current legislation, only qualified and certified gas boiler fitters are allowed to provide such services. Keep in mind that if you install anything on your own, you will make your warranty invalid, and this might affect your household insurance as well. This said, there are three main types of boilers. Combi, system, and regular. Bellow, you can find additional information about each type to determine which one fits your property the best. Regular boilers—Conventional boilers (also known as 'heat only' and 'open vent') function only with a tank and a cylinder. They use gas to heat up the water that is stored in the cylinder that is fed through a cold-water cistern. A regular boiler provides the heated water for the central heating. When some of the water evaporates, the feed and expansion tank supports the expansion of the water when the temperature rises. The pros of this type of boiler include hot water from multiple taps and the fact that it is easily replaceable. Combi boiler—The combination boiler (or combi for short) is a highly efficient central heating and water heating unit. It doesn't have a separate hot water cylinder which makes it a space-saving option. Usually, the combi boiler installation is done quickly because there is no need for a tank in the loft space. Also, they are able to provide shower experiences with high pressure without a pump. System boilers—These boilers heat up the water for your cylinder as well as your central heating system. Similarly to conventional boilers, they work by storing hot water but there are some notable differences. For starters, the most important components of the hot water and heating system are built into the unit which means quicker, easier installation. On the other hand, system boilers do not require a feed and expansion cistern. Electric boiler—As the name suggests, these units use electricity to generate heat. They do not require fuel such as gas or oil which is one of their primary advantages. Therefore they are considered to be much safer and take a little less space because there is no need for a fuel storage unit. The electric boiler installation is less time-consuming than the gas type. Gas boiler—These units are powered either by natural gas or LPG which stands for liquefied petroleum gas. Here is how they work: when the boiler is turned on, a combustion chamber is filled with gas. This section of the unit is connected to the main heat exchanger which is positioned right next to a cold water pipe. In turn, the high temperature of the gas heats up the water and there you have it. So, wondering what would be the best option for you? When it comes to heating up water for example, regular boilers are considered the more favourable option. However, a combi boiler might be more efficient for you because it doesn't lose heat from the hot water cylinder. If you are not sure what unit to get for your property, then don't worry about it – simply consult with the technician during the gas boiler servicing. If you are to replace your boiler, then you can buy a new unit but keep the hot water cylinder, or simply get a combi unit that doesn’t require a cylinder. When the technician arrives at your property, he will carefully examine the boiler to determine if there is anything wrong with it. He will start the boiler and do a gas rate check. After removing the casing, the main parts will be inspected to see if they function properly. The expert will use a flue gas analyser to determine if the combustion process isn't compromised in any way. Another test is done to ensure that there aren't any gas leaks. At end of the survey, you will receive a comprehensive service report that lists all the faults that were found, including a quote for replacement of gas boiler. If the repairs can performed on the same day, then the technician can carry them. Otherwise, he will just list them in the service report and you can set another date for your repairs. The gas boiler service in London is available within the M25 zone. What if the tests show that there is something wrong with my boiler? All issues found will be listed on the report and a quote will be provided for fixing each separate problem. What is the best way to keep my home safe from carbon monoxide? In order to ensure the safety of you and your family, have your gas appliances professionally checked at least once a year. And of course, a smoke alarm is mandatory. Make sure that nothing blocks your chimney and flues. Keep all air vents clear. What are the signs that my appliances are leaking carbon monoxide? Examine your appliances and the surfaces around them carefully for dark stains. Check the colour of your boiler's pilot light. If the flame is yellow (not blue as it is supposed to be), then you probably have a leak. I live in a rental. Who is responsible for checking the gas appliances? Do you provide any other boiler-related services? Yes, we also do Boiler Power Flushing which is a great service in case you spot cold zones on your radiators, the system is not effective or your boiler does weird kettle noises.